Four more tons of veggies leave the farm! “Oh! Oh my! Oh! Oh! Look! Look what’s in the share!” “I get apples, too? !” These were just some of the delighted exclaimations we heard at the share pick up yesterday. It was a great day to be at the farm. Lots of happy people, eaters and farmers alike. Nice weather, very managable traffic, lots of really good food, including Stone Hearth Pizza and homemade pumpkin cookies for lunch (thanks to Jane Sedgwick) and homemade apple pie for breakfast (courtesy Jane Hammer and her toaster oven!). We sipped apple cider from Cider Hill Orchards. Did I mention the very managable traffic? 73% of shareholders (110) car pooled, walked or biked to get their share. This share had a little more variety in leafy greens than last week’s share. Shareholders got either red Russian kale, tuscano kale or Swiss chard. Shares also contained either escarole or collard greens. If you are not sure which greens you took home, use the photo above to help identify yours. Here’s how. Double click on the photo. Then mouse over the vegetable in question and its name will pop up. 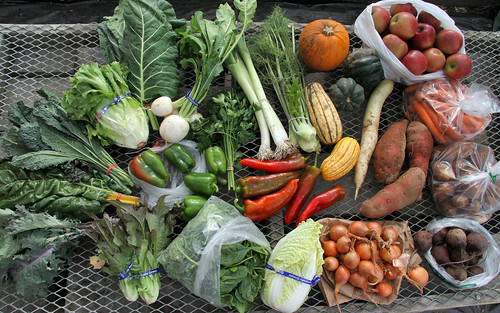 Kathy Martin, Belmont gardener, photographer and Winter CSA shareholder – thank you, thank you for these awesome photos!